Pulmonary rehabilitation, also known as pulmonary rehab or PR, is a program for people who have chronic (ongoing) breathing problems. It can help improve your ability to function and quality of life. PR does not replace your medical treatment. Instead, you use them together. PR is often an outpatient program that you do in a hospital or clinic. Some people have PR in their homes. You work with a team of health care providers to find ways to lessen your symptoms, increase your ability to exercise, and make it easier to do your daily activities. Have COPD (chronic obstructive pulmonary disease). The two main types are emphysema and chronic bronchitis. In COPD, your airways (tubes that carry air in and out of your lungs) are partially blocked. This makes it hard to get air in and out. Have an interstitial lung disease such as sarcoidosis and pulmonary fibrosis. These diseases cause scarring of the lungs over time. This makes it hard to get enough oxygen. Have cystic fibrosis (CF). CF is an inherited disease that causes thick, sticky mucus to collect in the lungs and block the airways. Need lung surgery. You may have PR before and after lung surgery to help you prepare for and recover from the surgery. Have a muscle-wasting disorder that affects the muscles used for breathing. An example is muscular dystrophy. PR works best if you start it before your disease is severe. However, even people who have advanced lung disease can benefit from PR. 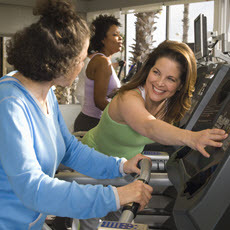 What does pulmonary rehabilitation include? Exercise training. Your team will come up with an exercise plan to improve your endurance and muscle strength. You will likely have exercises for both your arms and legs. You might use a treadmill, stationary bike, or weights. You may need to start slowly and increase your exercise as you get stronger. Nutritional counseling. Being either overweight or underweight can affect your breathing. A nutritious eating plan can help you work towards a healthy weight. Education about your disease and how to manage it. This includes learning how to avoid situations that make your symptoms worse, how to avoid infections, and how/when to take your medicines. Techniques you can use to save your energy. Your team may teach you easier ways to do daily tasks. For example, you may learn ways to avoid reaching, lifting, or bending. Those movements make it harder to breathe, since they use up energy and make you tighten your abdominal muscles. You may also learn how to better deal with stress, since stress can also take up energy and affect your breathing. Breathing strategies. You will learn techniques to improve your breathing. These techniques may increase your oxygen levels, decrease how often you take breaths, and keep your airways open longer. Psychological counseling and/or group support. It can feel scary to have trouble breathing. If you have a chronic lung disease, you are more likely to have depression, anxiety, or other emotional problems. Many PR programs include counseling and/or support groups. If not, your PR team may be able to refer you to an organization that offers them. Article: Pulmonary Rehabilitation in the Management of Chronic Lung Disease.